Posted July 31, 2012 under Ask Us. 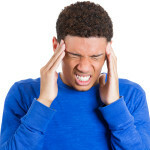 Migraine headaches are very common, affecting about 1 in every 10 people. People do tend to get fewer migraines as they get older, but unfortunately, there’s no “cure”. However, there are several things you can do to make migraines occur less often. Start by keeping a headache diary, noting the days you get a headache and what you were doing that day. If you can figure out what triggers your migraines (the most common triggers are stress, lack of sleep, dehydration, caffeine, and alcohol), try avoiding that trigger to keep the headaches away! You should also avoid taking medicine to stop the headaches (such as acetaminophen or ibuprofen) more than twice a week. Taking these medications more frequently can lead to a bad cycle of rebound headaches (where you get a headache as soon as the medication wears off, causing you to then take more of the medicine and keeping the cycle going). People who get migraines more than twice a week may benefit from taking a different type of daily medication to keep the migraines from happening so often. Talk to your health care provider if you’re interested in this type of medication.